There’s a school of thought which contends that the world doesn’t owe us a cent. Those who side with this thought tend to point out that colonialism, far from exploiting us and draining us of the resources that we have to purchase from the (former) colonisers, often at heftily jacked up prices, actually benefited us. The benefits, apparently, came in a variety of ways; the railway, the telephone service, agriculture and even electricity. What is conveniently forgotten, of course, is that these services were never for one moment conceived to benefit us. They were targeted at the exploiter, because the exploiter naturally thought that his kingdom wouldn’t erode. When it did, well, we took over what they bequeathed. And what they bequeathed weren’t just those services. What they bequeathed include the resource-deficits, broken economy, and a never-ending brain drain. The world does not owe us a cent because the world has moved on. The world does not owe us a cent because we can’t really force them to pay us. But there’s a problem. The world that exploited us left behind a self-perpetuating class of landowning elites who continue to make us want to hold a tin cup to everyone else. The services conceived to benefit the coloniser were also conceived to benefit that particular class. It is this class, aptly described and dissected by several social scientists, in various studies done through the years, who are incapable of moving us beyond their landowning worldview. In a pithy, vulgar sense, it’s the hamu-kolla mindset; we fetch their coconuts, they pay us. The biggest lesson 2015 taught us is that regime change involves more than just a cursory, superficial change of a government. It involves a paradigm shift in the way we think about transparency, democracy, and good governance. It also involves a paradigm shift in the way we look at the economic base that sustains the rhetoric over good governance, democracy, and transparency. A class that subsists on the easy dollar, that believes in selling off assets at a song and five cents, that has always conceded ground to privatisation, massively, will not be able to consolidate and legitimise a governmental change and transform it into a successful regime change. Such a shift requires the sustained transformation of the way we perceive the material (economics) as well as the abstract (good governance). When the one remains unaddressed, the other, naturally, weakens. The other lesson that 2015 taught us was that elites, be they affiliated to institutional cliques or specific social milieus, are not the be-all and end-all of good governance. Gentlemen don’t rob, so the saying goes. The sad truth, however and as we all know by now, is that, yes, they do. They just rob in such a manner that the way they evade the law, despite our assumptions about their involvement in such robberies, is hailed by their supporters as being classy and elegant. When gentlemen rob, in other words, their act of robbing is seen as something to celebrate; a confirmation of their affiliation to those institutional cliques and specific social subsets. Reminds me of what Hafeel Farisz once wrote in his interview with C. V. Wigneswaran: that it has been these elites who have pitted collectives against each other in the pursuit of their hazy, expedient goals. The rise of the Podu Jana Peramuna is, with respect to this demographic, a clear warning signal to the Government, but there too it’s a temporary trend. I cannot really see the SLPP clinch the presidency in 2020 unless and until the Government continues in the way it does, and even then, the anti-Rajapaksa vote (as Mangala Samaraweera pointed out, though in a rather erratic manner) has increased. 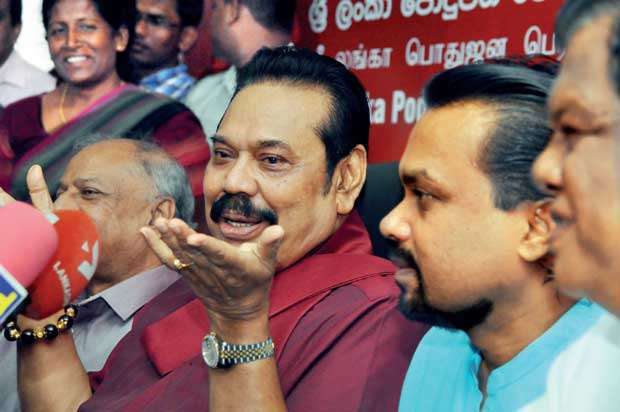 No self-respecting government would want to consolidate victory based on how several parties get together against a single entity, but if things go the way they have, 2020 would again be about the hansaya (minus the JVP) pitted against the kesara sinhaya. Pathetic at one level, though expedient at another. In any case, for the kesara sinhaya to rise, it has to convey its message in clearer terms. The gains it has made have been almost fully due to a communication problem with the Government. If that problem is resolved, and if the propaganda machine is well oiled and started, even the SLPP will not be spared. But while 2020 will pit the sinhaya against the hansaya, I predict that this will not congeal into the kind of conflict between elites and non-elites that we saw, rather despicably, in the baiyo-toiyo conflict from 2015 to 2017. The idealism of the typical young UNP supporter was the idealism of a middle class, urbane, sophisticated worldview: largely bourgeois, and based on the assumption that the only medicine for the country’s ills lay in the hands of a meritocratic elite which defined itself based on education (as if education was the ONLY criterion on which we could judge politicians and, indeed, human beings in general). What aggravated this conflict was that the Mahinda Rajapaksa administration housed a great many politicos who hailed from a certain social milieu which the stalwarts in the UNP, with their almost homogenous institutional affiliations, claimed to. What blew the balloon was the fact that these stalwarts, who appealed to the young, were blown off, and eventually marginalised. So no, the colonisers don’t owe us a cent. But the ‘meritocrats’ do. Big time.